Want to lose weight, improve your wellbeing and try a new cuisine? Now you can! 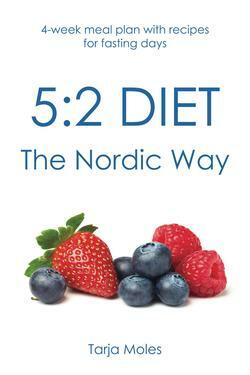 5:2 Diet – The Nordic Way brings you Nordic meal ideas and recipes for your fasting days. Many Nordic foods are considered to help improve health, and combining this with the 5:2 diet, you can soon be well on your way to a healthier lifestyle! By following the meal plan, you don’t have to count calories. Each fasting day is planned to suit both women and men’s requirements. The recipes are easy to make – even novice cooks can prepare the meals. All the measurements are given in metric, imperial and US cup measures so you can choose the most familiar way of cooking for you. All the meals are full of delicious and wholesome Nordic flavors which make your fasting days more interesting. With the help of this book you can easily immerse yourself in Nordic cuisine and super-charge your efforts to lose weight and improve your wellbeing! "I have a philosophy that encourages me to look at the way other nationalities cook and eat, so the book was a double benefit to me." "My daughter lives in Scandinavia and she is very food-conscious so I had good reason to read and like this book." "I have bought other cook books by Tarja Moles and I have to say I value all of them. I can heartily recommend this one." It's a 5:2 diet cookbook with a Nordic twist. I wrote a 5:2 diet cookbook in Finnish in 2014 and thought it would be nice to introduce some Nordic recipes to English-speakers as well. What is your favourite recipe in this book? Why? I love quark because it's so versatile and you can use it in breakfast dishes, main courses and desserts. So on that basis, my favourite recipes would be Blueberry and raspberry quark as well as Cranberry quark.